Join the discussion on our forums! 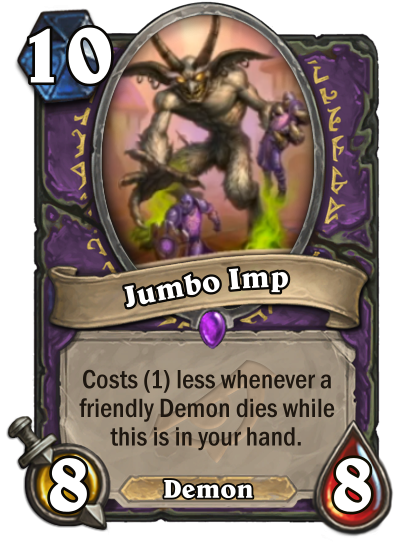 Come discuss Jumbo Imp over in our dedicated Jumbo Imp discussion topic. One of the best cards in the set imo. Don't sleep on this one. EDIT: Well, it's not that good in standard due to other imp summoning spells being too weak atm. Could be better if it gets some support from the next sets. Definitely better in wild though. Ofc it has to be in your hand, otherwise it would be too broken. I just tested it in wild and it was quite good. Not sure about standard tho, we'll see when the meta settles. Most of the time, you will not be able to play it for (0) but you still can play 8/8 for (5) or even (4). In my opinion, this card is not that great but playable in a few decks. Jumbo Imp? That's the best name you could come up with, Blizzard? As much a the optimal deck for this may want to be lots of small minions with a rafaam finisher, you could also use the neutral portal demons because each of them will eventually drop the cost of these guys by 4 and add more cards for rafaam if not. I especially like how shadowflameable the Portal Keeper is. This might make a demon Lock viable. Fascinating. Good thing it's friendly demons only, otherwise we'd have another Corridor Sleeper.